Rare 19th Cent English Shepherd's Smock in good condition. Came originally from one of the best shepherding collections in the country. Quality linen with stitching in good order. 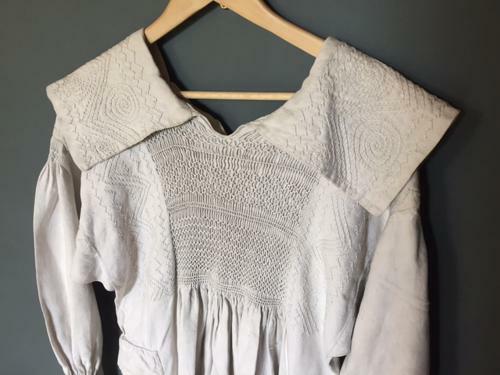 Good thread detail to double sided collar, gathered and smocked sleeves and cuffs. Bone buttons intact. Both pockets complete. Smocked panelling to both front and back. This is a double sided frock coat so was reversible. Smocks had become unfashionable by the late 1800's and a very hard to find in good condition. They sometimes survived as a keepsake representing all the man hours that had gone into making them. Typically they were worn by the shepherd as an over garment with a top hat and neckercheif at the collar.. Later shepherd's wore flat caps and an overcoat but never with a smock.